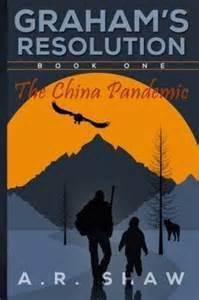 The China Pandemic (Graham’s Resolution: Book 1) by A.R. Shaw. 268 pages. This was a great story. It was also poorly written. There. That about sums up my review. “What the world dreads most has happened– because of a mutated avian bird flu (H5N1) pandemic. It has ravaged the globe. Only 2% of the population has survived. A dying mother knows that her young child is among the few immune to the virus. What will she do to ensure his survival before her own coming tragic death? First, the author has shared a great apocalyptic story. A flu-type virus has come from China, killing all but 2% of the population. Those who are left are divided into those who have been exposed and survived, and those who have managed to not be exposed, but remain fearful of such a thing happening. The book does a good job of staying out of a global view of things. Instead, the first half of the book is spent with individuals meeting and becoming a group, with Graham the leader, and then trying to get out the big city without being killed. I like the real-life dangers, ones that one wouldn’t anticipate. I also liked the fact that the characters were focused on daily needs such as what to eat and where to go to the bathroom. It made it very real. The author also does a good job of helping the reader like each of the characters. That’s the good news. Even though the Amazon page said it was completely reedited in 2013, I found the editing pretty bad. Punctuation and grammar were a problem throughout. There were formatting problems. In addition there were some plausibility problems. One problem that didn’t have to do with editing was the fact that much of the first chapter or so was spent in exposition: I found myself being told the story rather than living it. The author took a very good idea for a story, but I thought had a hard time delivering it professionally.